Radiance is a book whose brilliance is in some ways a liability. It's impossible to deny the mastery of its craft, but if you aren't prepared for what you're getting into you can easily find yourself overwhelmed early on. It throws up so many layers of artifice that it's difficult to feel much but the most cursory emotional investment in its characters. But the way in which the book is essentially about its own artifice, without being tediously meta, is probably its most inspired storytelling hook. It's a novel about how our lives are narratives, and how those narratives can become grand and mythic and larger than all possible life when others add to them. 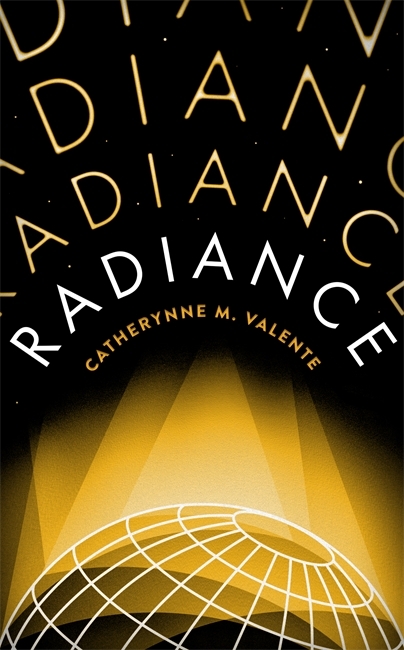 Radiance may be a novel that is easier to admire at an intellectual level than enjoy as entertainment, but there's no doubt Catherynne Valente is an often astonishing talent, even if the kitchen-sink approach she's taken to Radiance means that form trumps content more often than not. The novel is an art-deco planetary romance set in the early-to-mid 20th century, in an alternate history where the human race has long colonized the entire solar system. Space is something not quite a vacuum, and all the planets are closer together and teeming with life. Venus is a lush and tropical world covered in oceans, the Moon is an airy resort, and even distant Pluto is verdant and populated by packs of giant buffalo-lizard things. It's connected physically to its moon Charon by a bridge of vines covered in dazzling flowers. The story deals with the mysterious disappearance of Severin Unck, the quixotic daughter of famed silent filmmaker Percival Unck. The daughter of a filmmaker herself, Valente has a boundless passion for the art form, and denies herself nothing when it comes to imagining her own fanciful version of its glamourous, jazz age past, populating her tale with a parade of stars and directors and crewmembers and gossip columnists and the other coattail-riders drawn like moths to the flame of celebrity. Valente imagines Percival as a kind of Orson Welles/Erich von Stroheim hybrid, a driven auteur with a nearly manic need to work and rework his own projects. Severin, on the other hand, is more pragmatic, having grown up within her father's halo and less than impressed with the florid melodramas he creates. Her own approach to directing is closer to docudrama, her movies based on stories from life. For her newest film, Severin has chosen to investigate the mystery of the Venusian city of Adonis, whose population has entirely vanished save for one confused, non-verbal little boy, Anchises. No one has any idea what has happened, though there is speculation that it all may have something to do with the callowhales, strange aquatic creatures who may or may not be alive in the generally understood sense of the word, and whose milk is considered an exotic delicacy. It is while on location in Adonis that something happens to cause Severin to vanish and some members of her crew to be killed, but only a few fragments of badly damaged film from the shoot survive. For decades after, in an effort to make sense of what became of his daughter, Percival is obsessively crafting a movie about her, which he keeps rewriting so much that it's becoming surreal enough to baffle Luis Buñuel. Meanwhile, Anchises, now an adult, is hired by the production company funding Severin's film to help locate the woman and, incidentally, whatever may be salvaged of their intellectual property. 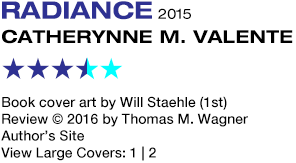 It's an amazing tale in summary, but the storytelling choices Valente has made will determine its level of accessibility to you. The book is written as a series of interview excerpts, gossip columns, personal memoirs and screenplay treatments. While this suits the subject matter, it breaks up anything that might be considered conventional narrative flow. It reads like a collection of vignettes. Valente's command of language is a glorious thing in which to marinate your brain. But as I've said, with so much artifice, the emotional connections that readers develop through the usual methods of character and story development can be harder to make. In the book's later passages, as the tale becomes more and more hallucinatory, some readers may find it all just too much of a muchness. If you stick it out, I think you will find those connections, but I won't pretend you're in for an easy time of it. For the adventurous reader, what emerges is a unique vision meshing retro space opera with New Weird, whose imagery will continue to flicker in your mind long after the projector has gone dark, and the house lights are up.